Visit them all and really see Scotland! Anyone who has walked or climbed in Scotland will sooner or later come across a view indicator – one of the discs or plates which identify surrounding features in the landscape. This is the first full-length work devoted to these devices. Since the first indicator appeared in 1890 at Ladies’ Rock in Stirling, more than 340 have been installed at viewpoints around Scotland – on hilltops, coastal sites, historic buildings, parks, golf courses and lay-bys. They range from the Mull of Galloway to Shetland, and from sea level to the country’s highest mountains. 349 Views of Scotland is a comprehensive and intriguing listing of these indicators, providing information about their physical description, designer, date and the various trusts, groups, councils, etc. that built them. Thirty-two maps show where the indicators are located and there are over 130 photographs, some of which date back many years, providing a fascinating historical aspect to the book. In the course of his research, the author has visited all the sites on the list. Inspiration for the project came from the work of the mountaineer Ben Humble, who published a catalogue of Scotland’s indicators in the 1930s and made a journey around many of them in the summer of 1938, reporting his findings to the Glasgow Evening Times. Another prompt was the question posed in the Cairngorm Club Journal in July, 1939: Instead of bagging a few more Munros, why not all the indicators? 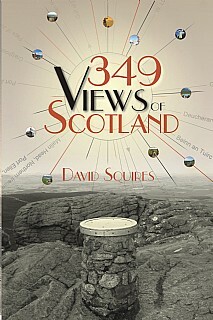 View indicators have been installed at some of the finest viewpoints in Scotland and this book will be an inspiration and essential companion for anyone visiting the viewpoints and wishing to know more about their history. Will be of special interest and appeal to all hillwalkers and mountain climbers and anyone interested in the outdoors and quirky historical information.